In one of the largest evidence-gathering clinical trials in orthopedic history, Zimmer Biomet is launching a study designed to assess the impact of its mymobility app's use on patient outcomes and overall costs for joint replacement. During the study, patients will use Zimmer Biomet mymobility with Apple Watch to act as a companion on the entire surgical journey. Researchers will combine patient-reported feedback with continuous health and activity data from Apple Watch to guide patients through pre- and post-operative care and gain new insights that may affect the standard of care for these common surgeries. The study launched Oct. 15 and may enroll as many as 10,000 patient participants in the United States. Rush University Medical Center is one of 17 sites in the United States currently participating in the study and the only participating academic medical center in Illinois. More than 1 million knee and hip replacements occur annually in the U.S. This number is expected to grow to 3.5 million by 2035, yet standardization of care and recovery for the procedures is still lacking and costs to the U.S. health care system continue to rise. Zimmer Biomet mymobility and Apple Watch will act in tandem as a virtual and continuous care team on a patient's wrist, according to Dr. Craig J. Della Valle, professor in the Department of Department of Orthopedic Surgery and chief of the Division of Adult Reconstruction at Rush University Medical Center. 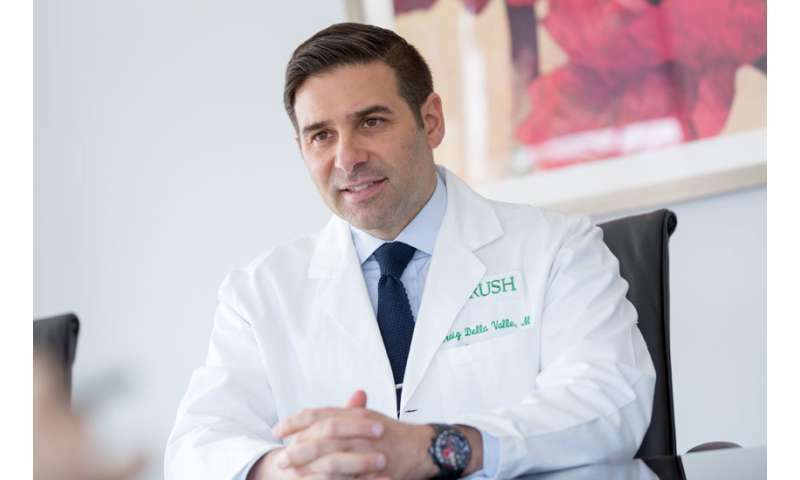 He and Dr. Richard Berger, assistant professor of orthopedic surgery, are co-investigators of the study at Rush. The use of the app with Apple Watch will provide patients with virtual support and guidance as they prepare for and recover from these surgeries. The app has several features that use both Apple Watch and iPhone, including the ability for surgeons to send education and therapy reminders directly to the patient's Apple Watch. The app also allows surgeons to monitor patient activity levels throughout the days and weeks while they are preparing for and recovering from surgery. Adult patients who own an iPhone 6 or later may be considered for enrollment in the mymobility clinical study if they are scheduled to have a total or partial knee replacement or total hip replacement at an approved clinical study site where they will be receiving a Zimmer Biomet device as part of their clinical care. Other inclusion criteria include a diagnosis of osteoarthritis.